Selects all objects in all categories. A search term can be entered here. 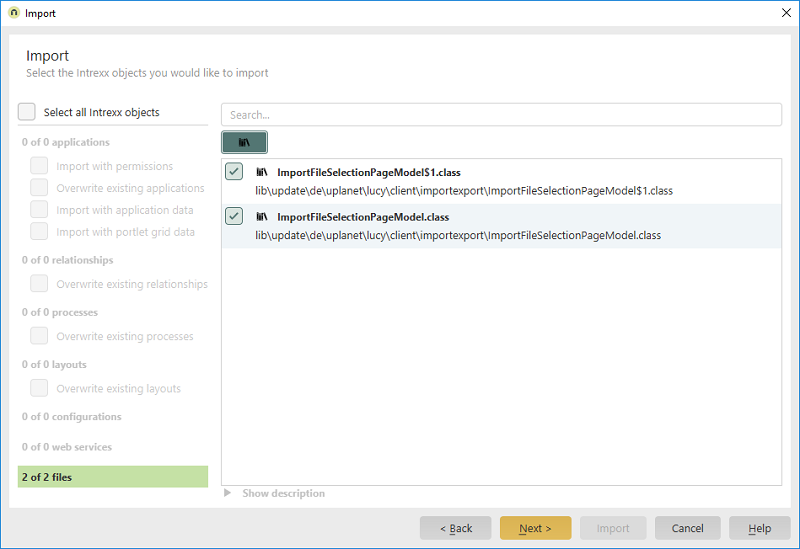 The list of import objects for the selected category is then filtered based on the entered term. When you select a category, every importable object of this type is listed on the right. Activate the checkboxes there for each object that you would like to import. On the left-hand side, you will then see how many objects of that category have been selected for import. If you click on "Show description", a text area will appear at the bottom of the object list. The description(s) of the import object(s) from all categories (except for web services) will be shown here. 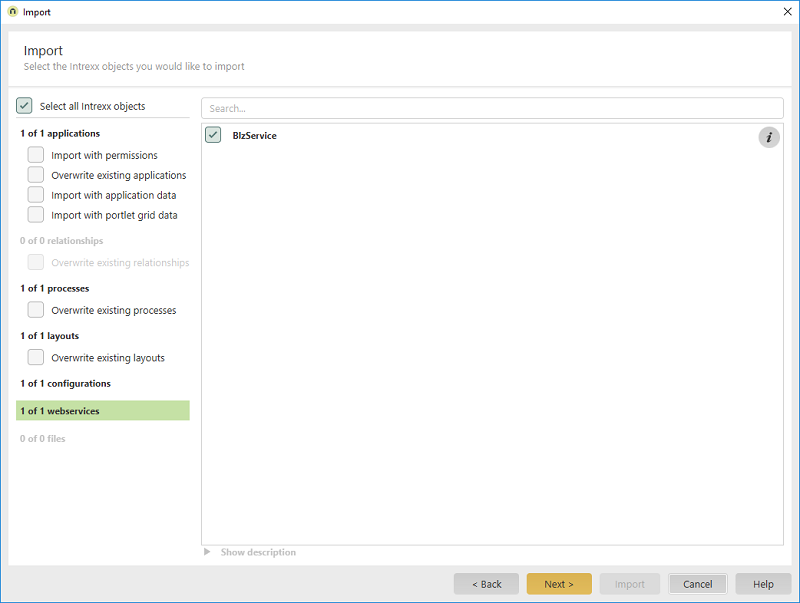 With this setting, all permissions defined in the application properties will be included in the export. If the portal contains an application with the same GUID, this will be overwritten by the imported application. Please note that data could be lost in this process, e.g. 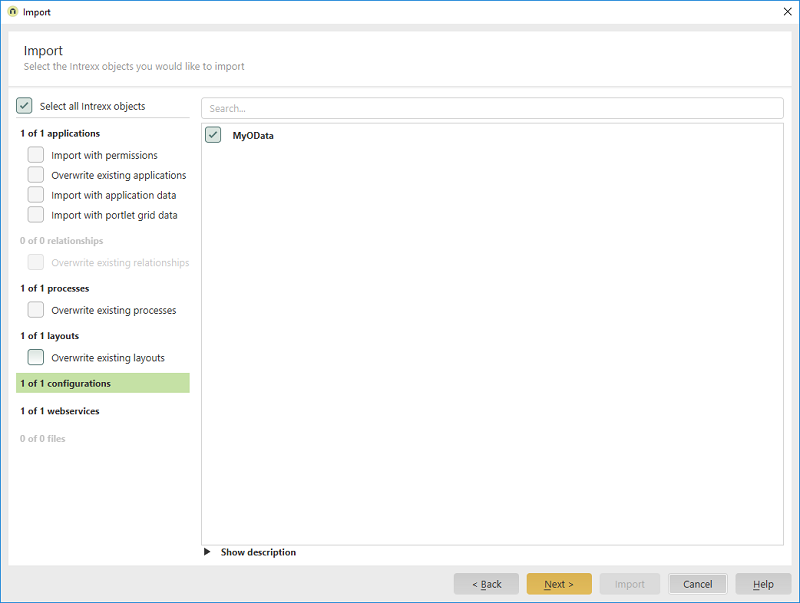 if the existing application contains a data field that is no longer in the imported application. All data recorded in the application is transferred as well during the import. Opens a dialog where information about the version number is displayed. Opens a dialog where objects that are connected to the import object can be included in the import as well. Opens a dialog where information about the entries in the history is displayed. 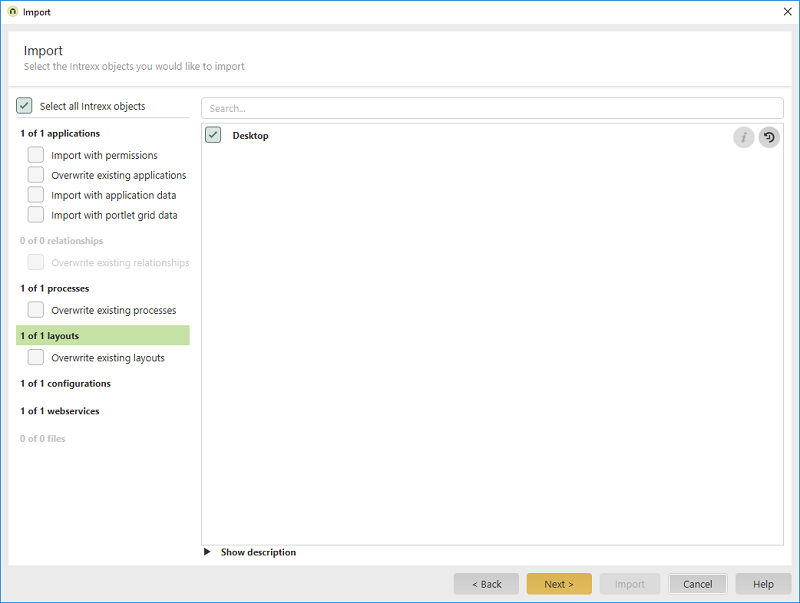 With this setting, the grids from all of the portlet containers in the application will be imported. If the portal contains a relationship diagram with the same GUID, this will be overwritten by the imported relationship. If the portal contains a process with the same GUID, this will be overwritten by the imported process. After the import, the process will be activated. The process will not be activated after the import. If the portal contains a layout with the same GUID, this will be overwritten by the imported layout. 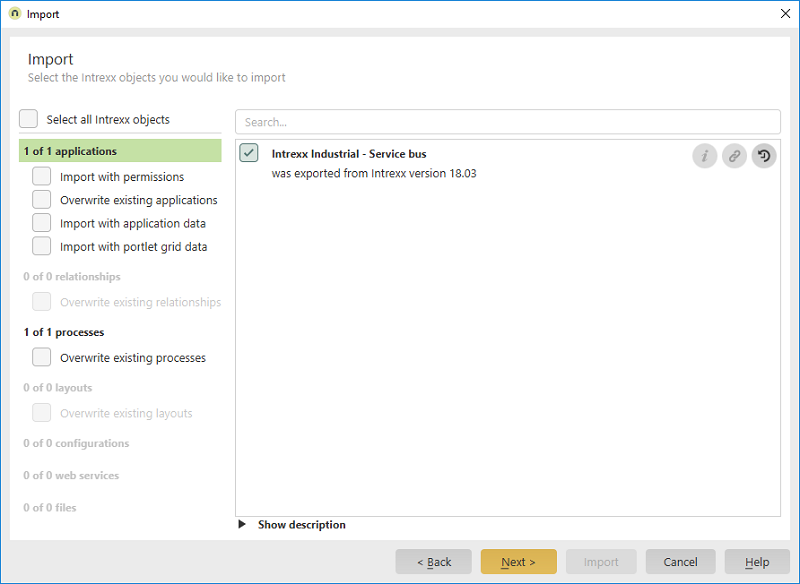 Connections to external data sources can be selected for import here. 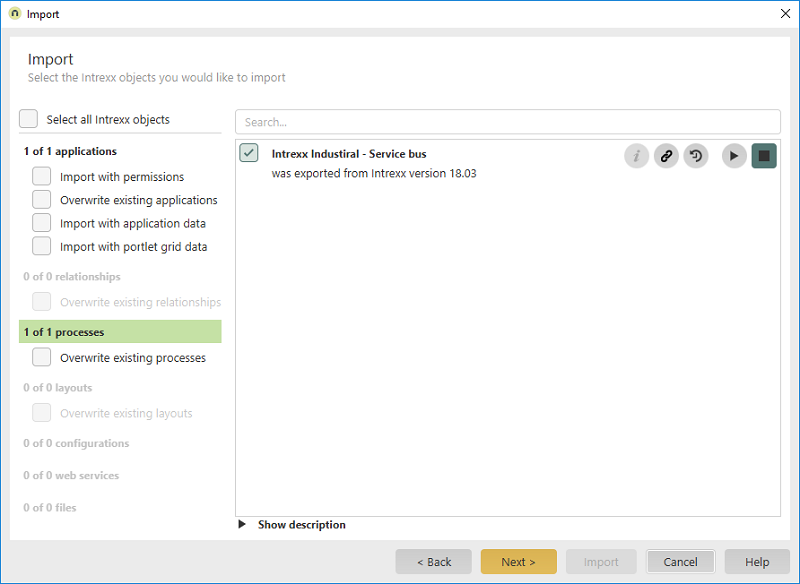 Configuration files and libraries can be selected for the import here. Shows or hides the libraries, respectively.